In mathematics, a continuous function is a function for which sufficiently small changes in the input result in arbitrarily small changes in the output. Otherwise, a function is said to be a discontinuous function. A continuous function with a continuous inverse function is called a homeomorphism. Continuity of functions is one of the core concepts of topology, which is treated in full generality below. The introductory portion of this article focuses on the special case where the inputs and outputs of functions are real numbers. A stronger form of continuity is uniform continuity. In addition, this article discusses the definition for the more general case of functions between two metric spaces. In order theory, especially in domain theory, one considers a notion of continuity known as Scott continuity. Other forms of continuity do exist but they are not discussed in this article. As an example, consider the function h(t), which describes the height of a growing flower at time t. This function is continuous. By contrast, if M(t) denotes the amount of money in a bank account at time t, then the function jumps at each point in time when money is deposited or withdrawn, so the function M(t) is discontinuous. of the dependent variable y (see e.g. Cours d'Analyse, p. 34). Cauchy defined infinitely small quantities in terms of variable quantities, and his definition of continuity closely parallels the infinitesimal definition used today (see microcontinuity). The formal definition and the distinction between pointwise continuity and uniform continuity were first given by Bolzano in the 1830s but the work wasn't published until the 1930s. Like Bolzano, Karl Weierstrass denied continuity of a function at a point c unless it was defined at and on both sides of c, but Édouard Goursat allowed the function to be defined only at and on one side of c, and Camille Jordan allowed it even if the function was defined only at c. All three of those nonequivalent definitions of pointwise continuity are still in use. Eduard Heine provided the first published definition of uniform continuity in 1872, but based these ideas on lectures given by Peter Gustav Lejeune Dirichlet in 1854. A real function, that is a function from real numbers to real numbers can be represented by a graph in the Cartesian plane; such a function is continuous if, roughly speaking, the graph is a single unbroken curve whose domain is the entire real line. A more mathematically rigorous definition is given below. A rigorous definition of continuity of real functions is usually given in a first course in calculus in terms of the idea of a limit. First, a function f with variable x is said to be continuous at the point c on the real line, if the limit of f(x), as x approaches that point c, is equal to the value f(c); and second, the function (as a whole) is said to be continuous, if it is continuous at every point. A function is said to be discontinuous (or to have a discontinuity) at some point when it is not continuous there. These points themselves are also addressed as discontinuities. There are several different definitions of continuity of a function. Sometimes a function is said to be continuous if it is continuous at every point in its domain. In this case, the function f(x) = tan(x), with the domain of all real x ≠ (2n+1)π/2, n any integer, is continuous. Sometimes an exception is made for boundaries of the domain. For example, the graph of the function f(x) = √x, with the domain of all non-negative reals, has a left-hand endpoint. In this case only the limit from the right is required to equal the value of the function. Under this definition f is continuous at the boundary x = 0 and so for all non-negative arguments. The most common and restrictive definition is that a function is continuous if it is continuous at all real numbers. In this case, the previous two examples are not continuous, but every polynomial function is continuous, as are the sine, cosine, and exponential functions. Care should be exercised in using the word continuous, so that it is clear from the context which meaning of the word is intended. Using mathematical notation, there are several ways to define continuous functions in each of the three senses mentioned above. In detail this means three conditions: first, f has to be defined at c (guaranteed by the requirement that c is in the domain of f). Second, the limit on the left hand side of that equation has to exist. Third, the value of this limit must equal f(c). This definition only requires that the domain and the codomain are topological spaces and is thus the most general definition. It follows from this definition that a function f is automatically continuous at every isolated point of its domain. As a specific example, every real valued function on the set of integers is continuous. Illustration of the ε-δ-definition: for ε=0.5, c=2, the value δ=0.5 satisfies the condition of the definition. More intuitively, we can say that if we want to get all the f(x) values to stay in some small neighborhood around f(x0), we simply need to choose a small enough neighborhood for the x values around x0. If we can do that no matter how small the f(x) neighborhood is, then f is continuous at x0. In modern terms, this is generalized by the definition of continuity of a function with respect to a basis for the topology, here the metric topology. Weierstrass had required that the interval x0 − δ < x < x0 + δ be entirely within the domain D, but Jordan removed that restriction. A function is continuous in x0 if it is C-continuous for some control function C.
The failure of a function to be continuous at a point is quantified by its oscillation. A benefit of this definition is that it quantifies discontinuity: the oscillation gives how much the function is discontinuous at a point. This definition is useful in descriptive set theory to study the set of discontinuities and continuous points – the continuous points are the intersection of the sets where the oscillation is less than ε (hence a Gδ set) – and gives a very quick proof of one direction of the Lebesgue integrability condition. The oscillation is equivalent to the ε-δ definition by a simple re-arrangement, and by using a limit (lim sup, lim inf) to define oscillation: if (at a given point) for a given ε0 there is no δ that satisfies the ε-δ definition, then the oscillation is at least ε0, and conversely if for every ε there is a desired δ, the oscillation is 0. The oscillation definition can be naturally generalized to maps from a topological space to a metric space. Cauchy defined continuity of a function in the following intuitive terms: an infinitesimal change in the independent variable corresponds to an infinitesimal change of the dependent variable (see Cours d'analyse, page 34). Non-standard analysis is a way of making this mathematically rigorous. The real line is augmented by the addition of infinite and infinitesimal numbers to form the hyperreal numbers. In nonstandard analysis, continuity can be defined as follows. (see microcontinuity). In other words, an infinitesimal increment of the independent variable always produces to an infinitesimal change of the dependent variable, giving a modern expression to Augustin-Louis Cauchy's definition of continuity. 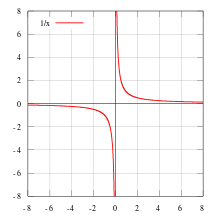 The graph of a cubic function has no jumps or holes. The function is continuous. The graph of a continuous rational function. The function is not defined for x=−2. The vertical and horizontal lines are asymptotes. is defined for all real numbers x ≠ −2 and is continuous at every such point. Thus it is a continuous function. The question of continuity at x = −2 does not arise, since x = −2 is not in the domain of y. There is no continuous function F: R → R that agrees with y(x) for all x ≠ −2. the sinc-function becomes a continuous function on all real numbers. The term removable singularity is used in such cases, when (re)defining values of a function to coincide with the appropriate limits make a function continuous at specific points.
. Thus, the signum function is discontinuous at 0 (see section 2.1.3).
. Intuitively we can think of this type of discontinuity as a sudden jump in function values. Point plot of Thomae's function on the interval (0,1). The topmost point in the middle shows f(1/2) = 1/2. If the real-valued function f is continuous on the closed interval [a, b] and k is some number between f(a) and f(b), then there is some number c in [a, b] such that f(c) = k.
For example, if a child grows from 1 m to 1.5 m between the ages of two and six years, then, at some time between two and six years of age, the child's height must have been 1.25 m.
As a consequence, if f is continuous on [a, b] and f(a) and f(b) differ in sign, then, at some point c in [a, b], f(c) must equal zero. The extreme value theorem states that if a function f is defined on a closed interval [a,b] (or any closed and bounded set) and is continuous there, then the function attains its maximum, i.e. there exists c ∈ [a,b] with f(c) ≥ f(x) for all x ∈ [a,b]. The same is true of the minimum of f. These statements are not, in general, true if the function is defined on an open interval (a,b) (or any set that is not both closed and bounded), as, for example, the continuous function f(x) = 1/x, defined on the open interval (0,1), does not attain a maximum, being unbounded above. is everywhere continuous. However, it is not differentiable at x = 0 (but is so everywhere else). Weierstrass's function is also everywhere continuous but nowhere differentiable. (from an open interval (or open subset of R) Ω to the reals) such that f is n times differentiable and such that the n-th derivative of f is continuous is denoted Cn(Ω). See differentiability class. In the field of computer graphics, properties related (but not identical) to C0, C1, C2 are sometimes called G0 (continuity of position), G1 (continuity of tangency), and G2 (continuity of curvature); see Smoothness of curves and surfaces. is integrable (for example in the sense of the Riemann integral). The converse does not hold, as the (integrable, but discontinuous) sign function shows. A sequence of continuous functions fn(x) whose (pointwise) limit function f(x) is discontinuous. The convergence is not uniform. exists for all x in D, the resulting function f(x) is referred to as the pointwise limit of the sequence of functions (fn)n∈N. The pointwise limit function need not be continuous, even if all functions fn are continuous, as the animation at the right shows. However, f is continuous if all functions fn are continuous and the sequence converges uniformly, by the uniform convergence theorem. This theorem can be used to show that the exponential functions, logarithms, square root function, trigonometric functions are continuous. This is the same condition as for continuous functions, except that it is required to hold for x strictly larger than c only. Requiring it instead for all x with c − δ < x < c yields the notion of left-continuous functions. A function is continuous if and only if it is both right-continuous and left-continuous. The reverse condition is upper semi-continuity. then f is continuous at the point c in X (with respect to the given metrics) if for any positive real number ε, there exists a positive real number δ such that all x in X satisfying dX(x, c) < δ will also satisfy dY(f(x), f(c)) < ε. As in the case of real functions above, this is equivalent to the condition that for every sequence (xn) in X with limit lim xn = c, we have lim f(xn) = f(c). The latter condition can be weakened as follows: f is continuous at the point c if and only if for every convergent sequence (xn) in X with limit c, the sequence (f(xn)) is a Cauchy sequence, and c is in the domain of f.
The set of points at which a function between metric spaces is continuous is a Gδ set – this follows from the ε-δ definition of continuity. for all x in V.
The concept of continuity for functions between metric spaces can be strengthened in various ways by limiting the way δ depends on ε and c in the definition above. Intuitively, a function f as above is uniformly continuous if the δ does not depend on the point c. More precisely, it is required that for every real number ε > 0 there exists δ > 0 such that for every c, b ∈ X with dX(b, c) < δ, we have that dY(f(b), f(c)) < ε. Thus, any uniformly continuous function is continuous. The converse does not hold in general, but holds when the domain space X is compact. Uniformly continuous maps can be defined in the more general situation of uniform spaces. holds for any b, c in X. The Lipschitz condition occurs, for example, in the Picard–Lindelöf theorem concerning the solutions of ordinary differential equations. Another, more abstract, notion of continuity is continuity of functions between topological spaces in which there generally is no formal notion of distance, as there is in the case of metric spaces. A topological space is a set X together with a topology on X, which is a set of subsets of X satisfying a few requirements with respect to their unions and intersections that generalize the properties of the open balls in metric spaces while still allowing to talk about the neighbourhoods of a given point. The elements of a topology are called open subsets of X (with respect to the topology). is an open subset of X. That is, f is a function between the sets X and Y (not on the elements of the topology TX), but the continuity of f depends on the topologies used on X and Y. This is equivalent to the condition that the preimages of the closed sets (which are the complements of the open subsets) in Y are closed in X.
to any topological space T are continuous. On the other hand, if X is equipped with the indiscrete topology (in which the only open subsets are the empty set and X) and the space T set is at least T0, then the only continuous functions are the constant functions. Conversely, any function whose range is indiscrete is continuous. in Y, there is a neighborhood U of x such that f(U) ⊆ V.
This definition is equivalent to the same statement with neighborhoods restricted to open neighborhoods and can be restated in several ways by using preimages rather than images. is continuous at every point of X if and only if it is a continuous function. If X and Y are metric spaces, it is equivalent to consider the neighborhood system of open balls centered at x and f(x) instead of all neighborhoods. This gives back the above δ-ε definition of continuity in the context of metric spaces. In general topological spaces, there is no notion of nearness or distance. If however the target space is a Hausdorff space, it is still true that f is continuous at a if and only if the limit of f as x approaches a is f(a). At an isolated point, every function is continuous. Several equivalent definitions for a topological structure exist and thus there are several equivalent ways to define a continuous function. In several contexts, the topology of a space is conveniently specified in terms of limit points. In many instances, this is accomplished by specifying when a point is the limit of a sequence, but for some spaces that are too large in some sense, one specifies also when a point is the limit of more general sets of points indexed by a directed set, known as nets. A function is (Heine-)continuous only if it takes limits of sequences to limits of sequences. In the former case, preservation of limits is also sufficient; in the latter, a function may preserve all limits of sequences yet still fail to be continuous, and preservation of nets is a necessary and sufficient condition. In detail, a function f: X → Y is sequentially continuous if whenever a sequence (xn) in X converges to a limit x, the sequence (f(xn)) converges to f(x). Thus sequentially continuous functions "preserve sequential limits". Every continuous function is sequentially continuous. If X is a first-countable space and countable choice holds, then the converse also holds: any function preserving sequential limits is continuous. In particular, if X is a metric space, sequential continuity and continuity are equivalent. For non first-countable spaces, sequential continuity might be strictly weaker than continuity. (The spaces for which the two properties are equivalent are called sequential spaces.) This motivates the consideration of nets instead of sequences in general topological spaces. Continuous functions preserve limits of nets, and in fact this property characterizes continuous functions. for any subset A' of Y.
X is compact, then f(X) is compact. X is connected, then f(X) is connected. X is path-connected, then f(X) is path-connected. X is Lindelöf, then f(X) is Lindelöf. X is separable, then f(X) is separable. stays continuous if the topology τY is replaced by a coarser topology and/or τX is replaced by a finer topology. Symmetric to the concept of a continuous map is an open map, for which images of open sets are open. In fact, if an open map f has an inverse function, that inverse is continuous, and if a continuous map g has an inverse, that inverse is open. Given a bijective function f between two topological spaces, the inverse function f−1 need not be continuous. A bijective continuous function with continuous inverse function is called a homeomorphism. If a continuous bijection has as its domain a compact space and its codomain is Hausdorff, then it is a homeomorphism. where X is a topological space and S is a set (without a specified topology), the final topology on S is defined by letting the open sets of S be those subsets A of S for which f−1(A) is open in X. If S has an existing topology, f is continuous with respect to this topology if and only if the existing topology is coarser than the final topology on S. Thus the final topology can be characterized as the finest topology on S that makes f continuous. 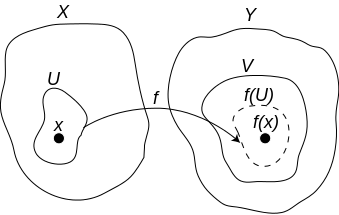 If f is surjective, this topology is canonically identified with the quotient topology under the equivalence relation defined by f.
for some open subset U of X. If S has an existing topology, f is continuous with respect to this topology if and only if the existing topology is finer than the initial topology on S. Thus the initial topology can be characterized as the coarsest topology on S that makes f continuous. If f is injective, this topology is canonically identified with the subspace topology of S, viewed as a subset of X. Various other mathematical domains use the concept of continuity in different, but related meanings. For example, in order theory, an order-preserving function f: X → Y between particular types of partially ordered sets X and Y is continuous if for each directed subset A of X, we have sup(f(A)) = f(sup(A)). Here sup is the supremum with respect to the orderings in X and Y, respectively. This notion of continuity is the same as topological continuity when the partially ordered sets are given the Scott topology. A continuity space is a generalization of metric spaces and posets, which uses the concept of quantales, and that can be used to unify the notions of metric spaces and domains. Wikimedia Commons has media related to Continuity (functions). ^ Speck, Jared (2014). "Continuity and Discontinuity" (PDF). MIT Math. p. 3. Retrieved 2016-09-02. Example 5. The function 1/x is continuous on (0, ∞) and on (−∞, 0), i.e., for x > 0 and for x < 0, in other words, at every point in its domain. However, it is not a continuous function since its domain is not an interval. It has a single point of discontinuity, namely x = 0, and it has an infinite discontinuity there. ^ Goubault-Larrecq, Jean (2013). Non-Hausdorff Topology and Domain Theory: Selected Topics in Point-Set Topology. Cambridge University Press. ISBN 1107034132. ^ Gierz, G.; Hofmann, K. H.; Keimel, K.; Lawson, J. D.; Mislove, M. W.; Scott, D. S. (2003). Continuous Lattices and Domains. Encyclopedia of Mathematics and its Applications. 93. Cambridge University Press. ISBN 0521803381. ^ Flagg, R. C. (1997). "Quantales and continuity spaces". Algebra Universalis. CiteSeerX 10.1.1.48.851. ^ Kopperman, R. (1988). "All topologies come from generalized metrics". American Mathematical Monthly. 95 (2): 89–97. doi:10.2307/2323060. ^ Flagg, B.; Kopperman, R. (1997). "Continuity spaces: Reconciling domains and metric spaces". Theoretical Computer Science. 177 (1): 111–138. doi:10.1016/S0304-3975(97)00236-3.